A last minute planning (or rather the lack of it!) on a midweek off, checking the cheapest available ticket I could find, I set out to South Wales for a short 2 day break. Checking Airbnb I found the very friendly Mr.Mike's family in Barry Island at whose house we stayed. 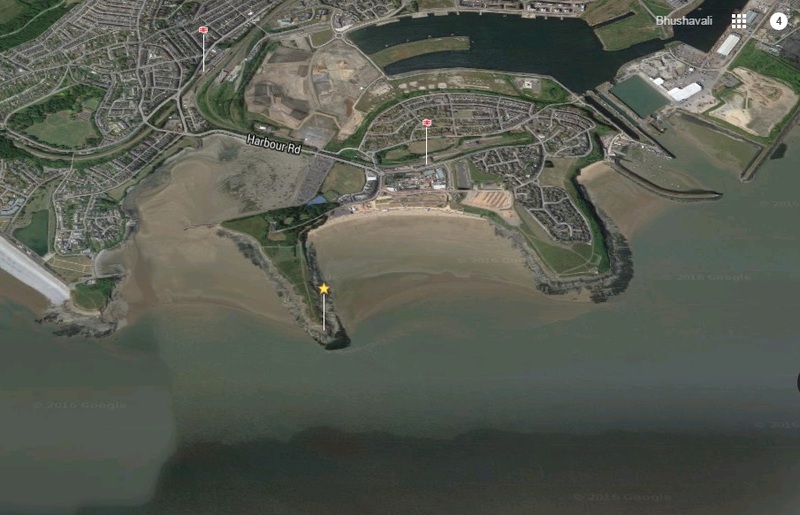 Barry Island is a beautiful peninsula, a piece of land almost separated from main land except for a bit (check out the above screen shot from Google Maps). So the coast, the beach called the Whitmore Bay is what is just spectacular here. The place would be pretty crowded and perfect for family day outs with children, on a midweek this is actually peaceful and is absolutely serene with very few people. We explored the beach early in the morning from its tip and walked along the bay. Further on the other side of the tip ahead comes the Porthkerry beach. After that is Aberthaw and from that point to Ogmore is about 20km which is called the Heritage Coast. Sadly in our 2 days we could explore either the Heritage Coast or the Roman ruins which was on the other direction. So we had skip this. However, I wish I go there again to explore the coast which has several types of beaches all along from white sand to cliff to green pastures to rocky terrain to pebbles to castles and lot more!!! The Whitmore Bay is what I explored. Its a sandy beach and with a low tide, the waves were pretty inward. The most precious feel for me was that I'm seeing a beach after about 5 months!!! Unlike any beach that I've seen in India, the Whitemore bay was absolutely silent with no roar of the waves at all!!! There are certain points which are rocky and at those points there are some benches which make a sunset or a sunrise just gorgeously romantic! There is a Barry pleasure park here which is a little amusement park. There is also a pirate ship model!!! Perfect for family outings with little kids. And I'm pretty sure weekends would be pretty crowded. There is also a point where the wall has a huge, larger than life sized letters saying Barry Island in both English and Welsh. Only when I went close did I realize its also a rock climbing wall!!! There are a couple of cafe's by the beach side. There are few very colorful beach huts which are available to rent for a day at £15 to £40 from 10 AM to 6 PM in winters to 10PM in summers! This can be booked online from the Vale of Glamorgan website. Cardiff has a major railway station, bus stand as well as airport. It would be nice to take a break at such a relaxing place like this! Barry Island sounds like my kind of place for a vacation with the family. Thanks for sharing the lovely sights you can see there. I hope you take more pictures of the other parts once you go back. I've never been to Wales and would love to. Sometimes I so wished that I lived in London so that I could visit every European country on my list. I dream of places like this! Those colorful beach huts are the perfect place for a photo shoot! This looks like a great place for a little getaway. Beaches are nice and when you see the colourful and inviting huts it makes it even more special. The beach looks really relaxing and would be a great breather for anybody. It's nice that they have colorful beach huts. This looks like one of those lonely beaches in British films where the characters go and meditate. This one even reminds me of that beach in Scarlett Johansson's alien movie "Under the Skin." It's truly so serene here. Isn't it a great feeling to have the beach all to yourself? I just love relaxing in such a place. It is a nice beach which i will say is a perfect way to relax and recharged yourself. This is a visual treat!! Looks like you had so much fun. That rock climbing shot is wow. the colorful huts beside the beach are soo pretty. I bet you could take lots of photoshoots there. I love the serenity if the beach. Thank you for the photos. The beach looks like a perfect place to relax for vacation and explore the inner city of Wales. Ooh I would very much enjoy this. Love the bench on the cliff and the colorful little houses! It looks like no one seems to be around too.